Is that building ugly, or a vital part of Singapore's heritage? 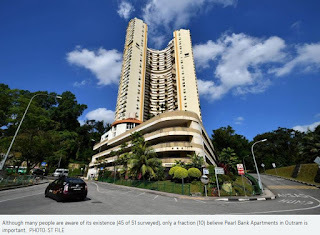 Many in the architecture and heritage communities believe the horseshoe-shaped Pearl Bank Apartments in Outram - which is at risk of demolition - is a beacon of modern Singaporean architecture and should be retained. But a new study indicates that members of the public do not share that sentiment. The team from the Institute of Policy Studies' (IPS) Social Lab found that while many are aware of its existence (45 of 51 surveyed), only a fraction (10) believes the structure is important. The team conducted preliminary focus group discussions with 51 Singaporeans aged 21 to 78 from September to October last year to understand the views of ordinary citizens towards Singapore's built heritage. In the focus group sessions, participants were asked to evaluate 90 structures, including national monuments, conserved buildings and heritage sites that were the subject of headlines recently. The 1976 Pearl Bank Apartments was sold to developer CapitaLand in a collective sale in February this year. Speaking to The Sunday Times, the study's lead researcher Paveena Seah, a senior research analyst at the IPS Social Lab, said some respondents evaluated the significance of some buildings lowly because they found them "ugly" or "rundown". 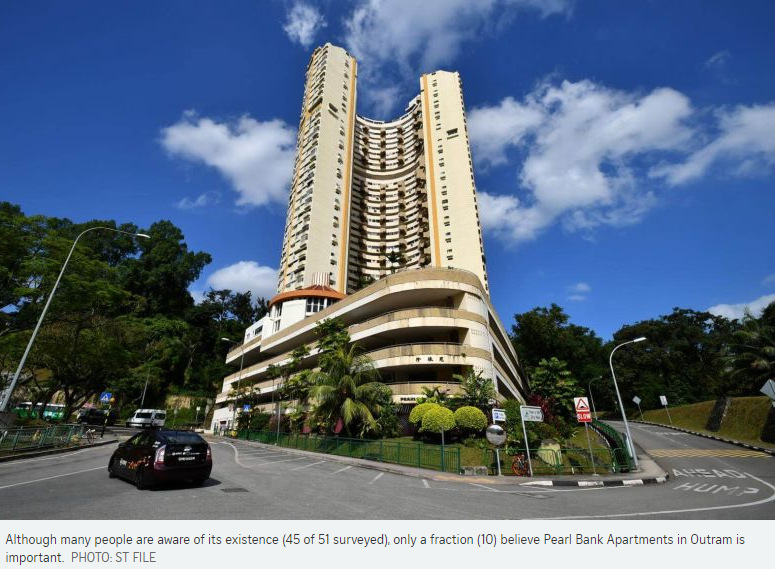 One respondent, for instance, described the Pearl Bank Apartments building as "a bit ugly", although another said its unique design "really shows the diversity of our urban landscape". In other cases, they had simply never heard of, seen or visited the place. Ms Seah said: "Respondents did not find them important because they had little to no knowledge about them." In a similar vein, perhaps hinting at a lack of awareness about the merits of post-independence "Singaporean" architecture, eight colonial-era buildings emerged as the respondents' top 10 most important buildings. Only two post-independence buildings - the Changi Airport control tower and People's Park Complex - featured in their top 10. The second phase of the IPS study, to take place later this year, will survey 1,500 Singaporeans for a nationally representative poll. This will help provide greater insight into the topic. The number of sites will be trimmed to about 50 in the new survey, and interviewers will be going door to door to conduct it. Believed to be the first of its kind, the IPS Social Lab study also comes at a time when familiar landmarks such as Golden Mile Complex and People's Park Complex are at risk of going en bloc and disappearing from the island's skyline. Other sites featured in the first phase of the study include the 1977 Rochor Centre, which will be demolished gradually from Tuesday in preparation for the Land Transport Authority's North-South Corridor. The head of IPS Social Lab, Dr Leong Chan-Hoong, said the study on public opinion is important since laymen's views are usually heard only in a piecemeal fashion whenever such redevelopment news breaks. The first phase of the study therefore helped the IPS researchers establish four criteria the public typically uses to appraise heritage sites. They are: their personal knowledge of a building's historical and sociocultural significance; collective and personal memories of the place; a structure's aesthetic appeal and functional utility; and, if applicable, whether the sites have been repurposed appropriately. Of the 90 buildings featured in the study, respondents were most familiar with landmarks in central Singapore. These included Raffles Hotel, St Andrew's Cathedral, Rochor Centre, Fullerton Hotel and Sri Mariamman Temple. The survey results also revealed that many were unfamiliar with the Chesed-El Synagogue monument, the conserved Beaulieu House at Sembawang Park, and old buildings such as the 1950s Palmer House in Tanjong Pagar. Fewer than half of the respondents said they were aware of these places. The team, which includes IPS Social Lab's senior research fellow Natalie Pang and research analyst Hou Minzheng, said the knowledge gap can be closed with more experiential learning activities such as more intensive heritage trails, increasing site accessibility and ramped-up programming at various venues by their respective managers and owners. Chang Architects' principal architect Chang Yong Ter said such surveys are useful in understanding ground sentiment. He added, however, that "aesthetic values are subjective and personal" and that acquired taste comes with time. "Discerning, expert eyes and professional bodies should make the final call on what should stay and what can go." The IPS researchers said their hope is for the study - which was supported by a grant from the National Heritage Board - to better equip policymakers in their approach towards built heritage conservation, education and engagement. Dr Pang said: "Given Singapore's need to balance between rapid urban renewal and heritage conservation, more needs to be done to study how the public assesses built heritage, what matters to which group of people, and why." The respondents ranked the following heritage places as less important to them, with some describing them as "ugly" or "rundown". "Lau Pa Sat is a really convenient place for us to eat at, especially for those who work around the CBD area"; "MacRitchie Reservoir is a really nice place for me to go for my runs or walks"; "Chijmes is a very nice place to dine at in the evenings, and also good for wedding photoshoots!" These were some of the remarks made by participants of the Institute of Policy Studies' Study On The Perception Of Singapore's Built Heritage And Landmarks, when asked why certain heritage sites or landmarks were important to them. Over a period of three months, we conducted seven focus group discussions with 51 Singaporeans, representing various age and ethnic groups. Our participants' occupations ranged from students to professionals, housewives and retirees. If there is one stark theme that emerged from these discussions, it is that the general public often takes a very utilitarian approach in appreciating heritage sites - if it is useful and relevant to their lives, they are more likely to evaluate it as important, and vice versa. According to our analysis of these discussions, this notion of utility or relevance, which we categorised as part of a dimension termed "physical attributes", was a consistent factor of consideration when it comes to the general public's evaluation of a heritage site's importance. Why is this dimension such an important one for our participants? First, unlike architects, historians or heritage interest groups, the general public often lacks expert and specialised knowledge about specific heritage sites. This makes the intrinsic appreciation of heritage sites difficult, whereas extrinsic appreciation (for example, by relying on the site's physical attributes) might be an easier alternative. This was evident in our focus groups where many participants readily admitted that their basis of evaluation was simply based on the superficial attributes (such as the looks or the usefulness) of the sites, given their limited knowledge about them. Second, heritage appreciation is unlikely to be constantly salient in many minds. Most people go about their daily lives with more mundane concerns, such as getting to work, getting food to eat, hanging out with friends and getting home. Unless the heritage site is something that features within the scope of their daily routines or preoccupations, experiencing or appreciating a heritage site, or both, necessarily means taking the extra effort or going out of the way to do so. It is therefore not uncommon in our focus groups to hear comments such as "It is too inconvenient for me to go to visit the site" or "I have actually never noticed the site even though I live (or work) so near it". In the light of these, how can we make heritage appreciation more accessible to the public? One way is to ensure that the site remains relevant to the everyday lives of people and their pursuits. When a site is relevant, it becomes easier for people to start taking an interest in it and to cultivate an appreciation of it - after all, the site becomes a place they start going to and forge memories of. For example, the former Tanjong Pagar Railway Station emerged as one of the more important heritage sites to our participants. These participants cited reasons of having been to the railway station whenever they travelled to Malaysia in the past. Their frequent experience with the railway station led to the generation of fond memories associated with the station. In addition, the unique designs of both the exterior and interior of the station further enhanced the perceived importance of the site to these participants. On the other hand, when the site is not immediately relevant, it may be difficult to convince people of its importance. For example, even though the National Aerated Water Company has been partially conserved, participants questioned the need to do so - the fact that the site appears to be a desolate and unused industrial building that currently does not feature in the lives of people was a key factor at play in leading to such an unfortunate evaluation. In this regard, the repurposing of the Boat Quay shophouses and Chijmes to their current use as dining and leisure spots can be considered as an effective strategy to preserve the relevance of these heritage areas to the lives of people today. In the same vein, however, the apparent lack of relevance of the Thow Kwang Dragon Kiln to our participants, coupled with its low accessibility, served to work against an appreciation of its significance. How the stakeholders of this site respond to this factor of relevance will be key to determining its future. Most important of all, the notion of relevance underscores our findings that such "everyday heritage" - sites that form an integral part of everyday living - are often highly valued by our participants. As a case in point, much of our built heritage today were in fact those that possessed high utility and relevance in people's lives in the past. The shophouses in Chinatown and along Upper Circular Road, for instance, were features of everyday life, and they have now become an indispensable facet of Singapore's unique heritage today. Moving forward, it may be unsurprising that our everyday places such as East Coast Park and Changi Village could become "heritage of the future", given their high utility as places of leisure, community, and sports. Ultimately, when it comes to heritage sites, uses matter. It is therefore imperative in the national heritage conversation to pay close attention to how the relevance of a site may make or break its future. Mike Hou is a PhD candidate in Psychology at the National University of Singapore. He is co-investigator of the Study On The Perception Of Singapore's Built Heritage And Landmarks, conducted by the Institute of Policy Studies. Do MPs and grassroots volunteers pay for parking?